The ninth Governor of Taiwan Province (1972–1978), the sixth and first local Taiwanese Vice President of the Republic of China (1978–1984) under president Chiang Ching-kuo (1908-2001). Signed colour portrait photograph. n.p.n.d. 126 : 87 mm. Nice signed official colour photograph of the Chinese politician. 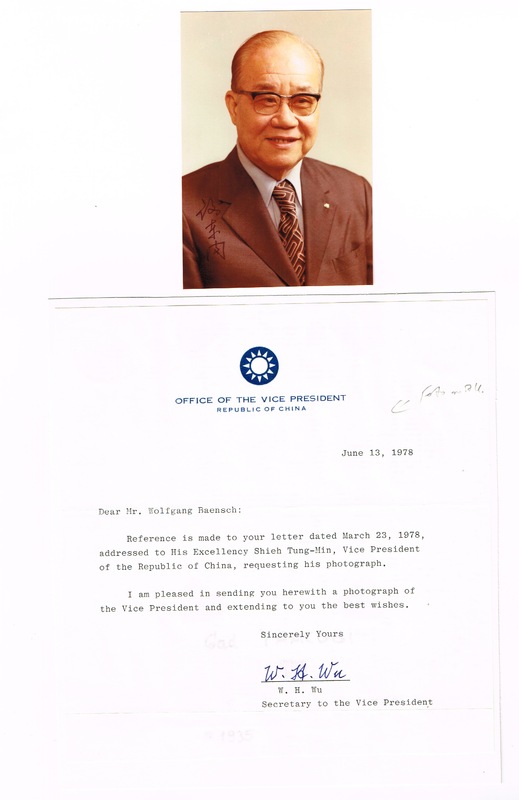 Together with an official letter by his secretary W. H. Wu. - Tung-min was born to an ordinary farming family in the Japanese colony of Taiwan. He was educated in Taichung in 1922. He graduated from Sun Yat-sen University in Guangzhou in 1928. Afterwards, he became a columnist in Hong Kong and Guangzhou. His brother, Shieh Min-chu is the president of Shih Chien University. His son is a physician. In 1942, Tung-min was invited to plan the Taiwan office of Kuomintang. During 1943 - 1945, he worked for anti-Japan activities in Guangdong. In 1945, after 20 and half years in the mainland, he went back to Taiwan as a KMT official. He became the first magistrate of Kaohsiung County in 1948, later Vice-director of Education of Taiwan Province, chancellor of National Taiwan Normal University, Secretary of Taiwan Province and Chief Councillor of Taiwan Province Council.Tung-min became the ninth governor of Taiwan Province in 1972. On October 10, 1966, he received a parcel bomb from Taiwanese nationalist Wang Sing-nan (who now serves as a legislator for the Democratic Progressive Party). The bomb destroyed both of Shieh's hands. To avoid scurvy, the hospital decided to cut his left hand and gave him an artificial left hand. Tung-min became vice president on May 20, 1978. 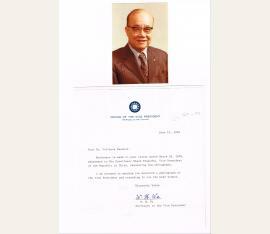 Afterwards he became senior secretary of the Presidential Office until his death in 2001. On March 26, 1958, Tung-min set up the first private university, the Shih Chien University in Kaohsiung. During his governorship and vice-presidency, he worked hard on educational affairs and success to make all people of the new generations of Taiwan to be educated..